what's cooking in my tuscan kitchen: A new twist on Ravioli! Gorgonzola, walnuts and honey! 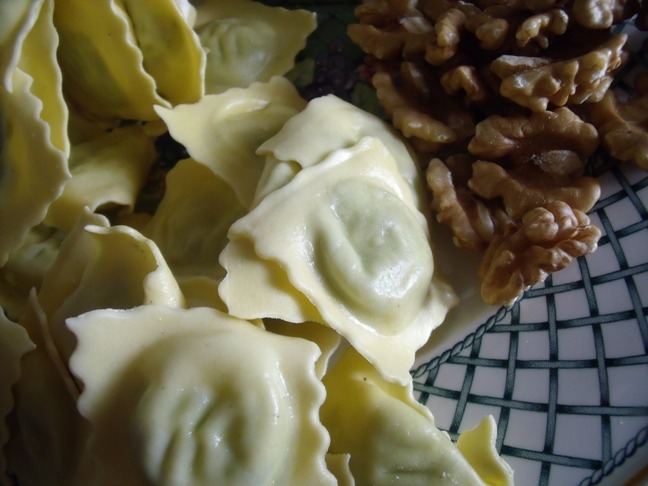 A new twist on Ravioli! 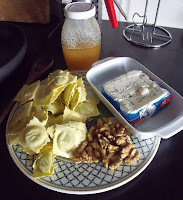 Gorgonzola, walnuts and honey! Still in a "nouvelle" state of mind... next time you want to WOW your dinner guests with a real "crest of the wave" first course, try this! For the last few years, wine bars and restaurants in Italy have been serving sharp cheeses with honey and nuts as an aperitif. So why not combine Gorgonzola, honey and walnuts in a delicious sauce for delicate ricotta ravioli?! This is so simple that it will take me longer to explain how to make than it takes to make it! First of all, a note on the Gorgonzola cheese. I don't like the really sharp, aged type and here in Italy they sell what is called "Duetto" which means duet. 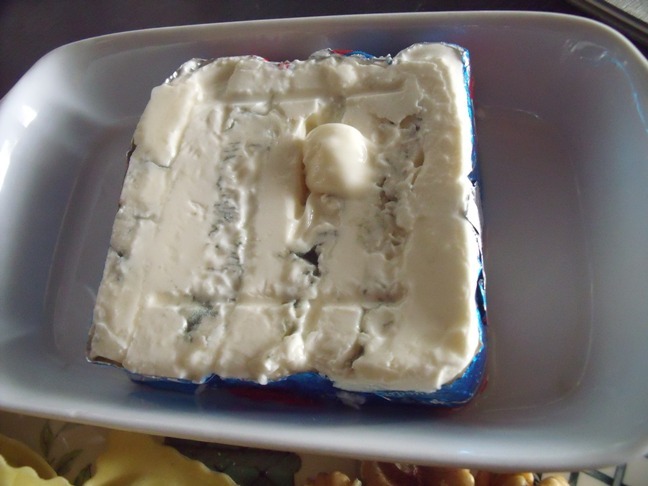 They layer Gorgonzola and Mascarpone cheeses and then cut it in slices. The result is a much milder flavor. I don't think you will find this in the USA, you may find it in Europe or the UK. 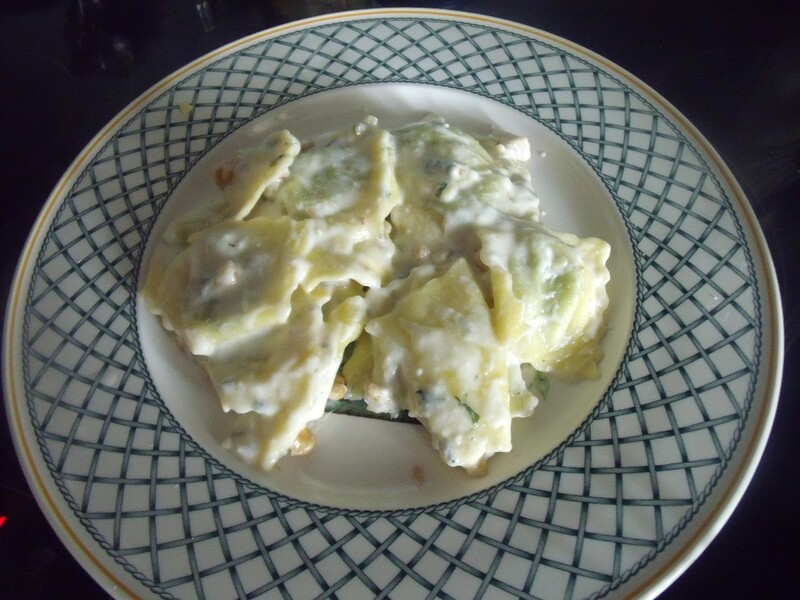 A good substitution would be to use half Gorgonzola and half Mascarpone, or if you can't find Mascarpone then half Gorgonzola and half heavy cream. 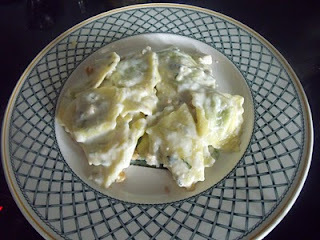 Of course if you love sharp Gorgonzola - go for it! Put a large pot of water on to boil. Put the Gorgonzola in a large fry pan over medium/low heat and allow it to melt. 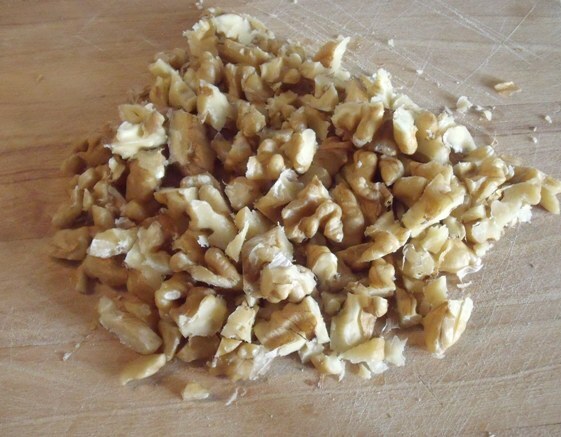 In the meantime, coarsely chop the nuts. 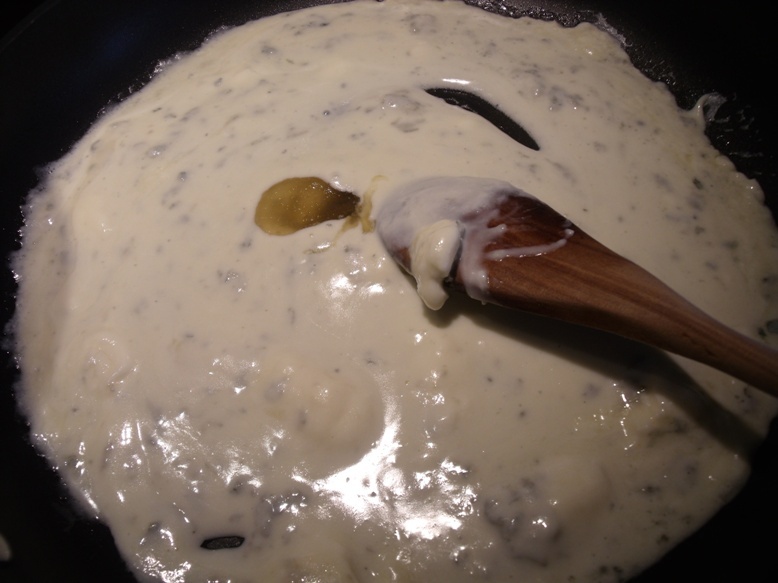 When the Gorgonzola is melted, add just a scant teaspoon of good quality honey. 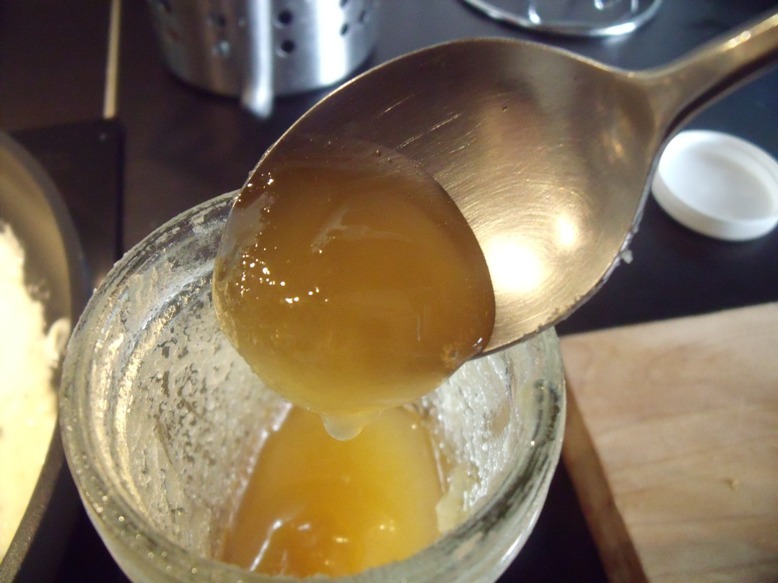 I used this great organic honey made by one of my Ravelry.com friends, Stefaneener. She came to Lucca, we met for a glass of white wine and the virtual became reality. She left me with the sweet taste of California in a jar of her homemade honey! Stir the honey into the Gorgonzola. When it is well blended, remove the pan from the heat. 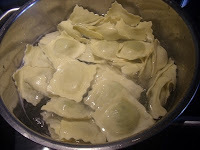 By now the water is boiling, so put the ravioli in to cook. If they are fresh, they should only take 2 to 5 minutes. If they are frozen, follow the directions on the package for cooking. 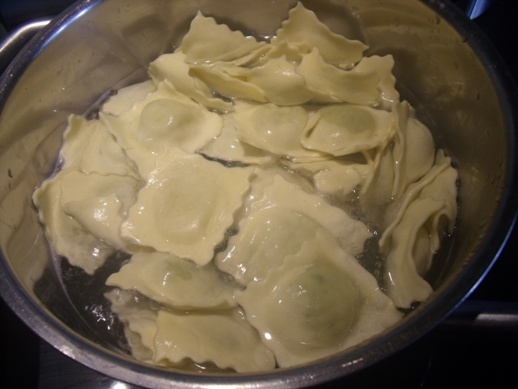 When the ravioli are done, drain well. 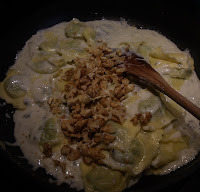 Put the pan with the Gorzonzola sauce back on medium heat and add the ravioli and chopped walntus. 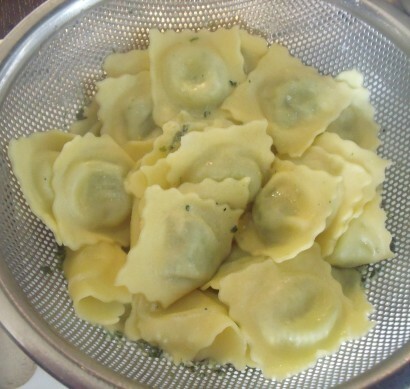 Gently toss the ravioli in the sauce they they are all coated with the sauce, being careful not to break the ravioli. That's it! Your are done! 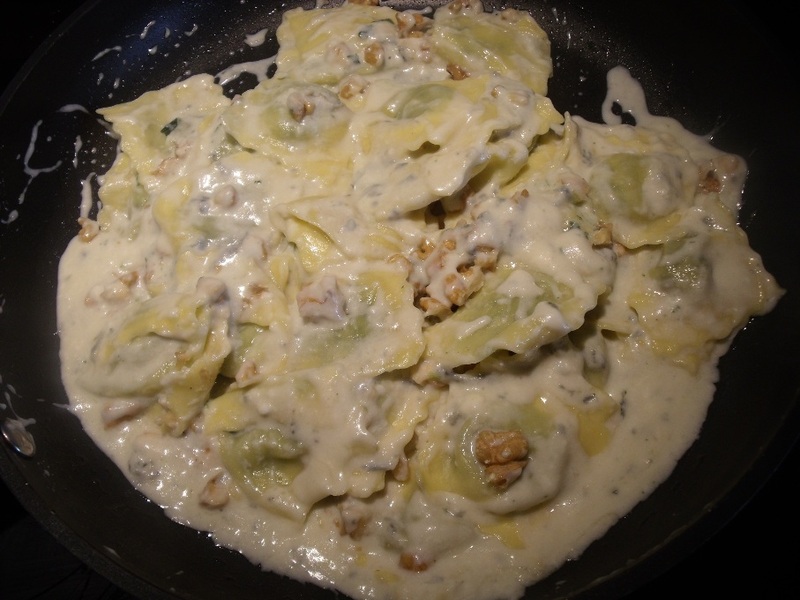 You can serve this dish with another drop of honey to garnish or freshly grated Parmesan cheese. Personally, I don't add a thing! Serve and wait for the compliments!! Wow, My mouth is watering, looks and sounds terrific. Going to try real soon, Grazie.